Isn't it the purpose of marketing to highlight the uniqueness of the product? Any marketing person will probably shake his head in despair, when they see you try advertise your product by announcing that it can be easily replaced by many other products. Now I will do exactly that with my recipe. I used bulgur as a whole grain base, as it can be fixed rather quickly. 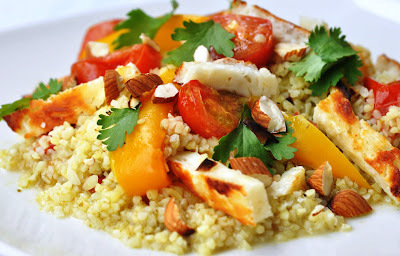 I am sure the dish will work well with cous cous, millet, or buckwheat. If you have some more time and patience, brown rice would be brilliant too, it just takes longer to cook. I used grilled tomatoes and bell peppers. Any other vegetable will be as good: I can imagine grilled zucchini slices, pumpkin, onion. The key is to slice or cube them into a size, so that they are all ready in about the same time as the grains, something about 15-20 minutes. I used toasted almonds. Any other nut will do here. I'd give it a try with pistachios or some roasted seed mix with pumpkin and sunflower seeds. Only the Halloumi cheese can't really be replaced and I wouldn't recommend it. Halloumi is the only cheese that doesn't melt when heated. It's got a lovely salty and tangy flavor. I love to eat it warm. It makes a perfect complement to grilled vegetables. You can even extend it by adding some shredded grilled chicken breast if you want a meatier dish. Place the chicken along with the veggies and the Halloumi on the baking sheet for grilling. It won't take much longer to cook than the rest. This is a delicious lunch or a quick dinner, yet it is filling enough so you won't get a craving for sweets soon after. Bon appetit! Put the bulgur wheat in a bowl. Sprinkle a pinch of salt over it. Cover with 2 cups of boiling water and let stand for about 20 minutes, or until bulgur is al dente or soft. When bulgur seems done, drain and squeeze remaining water. Set aside. In the meantime, cut cherry tomatoes in halves and bell pepper into strips. Put them in a bowl, drizzle a splash of olive oil over them and season with salt and pepper. Mix until vegetables are evenly coated with the oil and the seasoning. Cut Halloumi cheese into 1/4 inch slices. Place vegetables and Halloumi cheese next to each other on a baking sheet and place in the middle rack of the oven. Grill for about 20 minutes, or until Halloumi cheese turns golden brown at the edges. Take out the oven. Set aside. Roughly chop the almonds. Toast in a dry pan for 5-10 minutes, shaking the pan from time to time to ensure even toasting. Set aside. Place cooked bulgur on a serving dish. Stir in the cilantro pesto. Then combine with grilled vegetables and Halloumi. Sprinkle the almonds on top. Serve immediately.